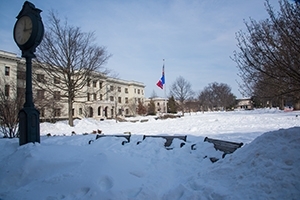 A photo of campus buried under snow dumped on the area during the January 2016 blizzard, otherwise known as "Snowzilla." Forget showdowns over the federal budget or getting a bill to pass both houses. If you really want to see DC frozen in its tracks, wait for a blizzard. Preferably one that dumps 1-3 feet of snow across the metro area. AU was closed from noon on Friday, January 22 through Tuesday, January 26. While some employees enjoyed an impromptu extended weekend, numerous others didn’t have that luxury. After all, there were still students on campus to be fed, kept safe, entertained, and allowed to continue their studies. Not to mention faculty and staff working on deadline, come hell or high water (or in this case, frozen, crystalline flakes of water). Stats don’t lie. Below, a by-the-numbers blizzard breakdown of just how hard intrepid staff worked to keep things running smoothly on campus and for AU staff members working remotely. 24 staff members kept the library open for students Sunday through Tuesday, from 11 a.m. to 6 p.m. The library was closed at the height of the storm on Saturday, January 23. Most of the library’s services were available, including Blackboard support, borrowing, course reserves, Graduate Research Center, Information Desk, Media Services, New Media Center, Printing Services, research and IM help--including late night/overnight chat to answer research questions--and Technology Services. 77 percent increase in “Reserves” books check-outs. 4,525 people came to the library. 123 movies loaned in advance of the storm on Thursday, January 21—twice the number of movie loans on the same Thursday last year. 45 research-related questions answeredthrough chat/IM. 2,629 people sweated out their cabin fever at Jacobs and Cassell fitness centers. 11 people manned the information desk and helped with University Center events. 15 hours of OCL-planned programming to entertain students featuring 5 different kinds of indoor, snowy-day activities (movies, Bingo!, board games, coloring, knitting). 20 staff attended and planned events. Experience #SnowyAU through students' photos and social media posts. 12,000 + meals served in TDR (Terrace Dining Room)—1,400 more meals (13 percent more) than they would usually serve under normal conditions. 4,000 purchases at the POD (Provisions On Demand). 18 people handled the work that normally requires 90 people. BRAVO! In addition to the dedicated food service workers, Charles Smith, director of auxiliary services, pitched in. Throughout the weekend, Smith worked 12 hour days in the kitchen making pancakes, cooking roasts and running stations to feed the AU community. President Kerwin visited TDR to thank staff and interact with students. 60 staff members directly supported snow removal operations. 10,000 lbs. of magnesium chloride applied to walkways and stairways and 8 tons of road salt on all campus roadways. 280 gallons of biodiesel to fuel diesel-powered equipment and vehicles. 1,200 cubic yards of snow transported and stockpiled. 11 building maintenance technicians supported facility related corrective and emergency repairs. 6 plows; 8 salt-rigs; 3 backhoe loaders; 1 dump truck; 8 snow throwers; 6 tractors; and 35 snow shovels. 85 OIT staff members worked full days from home, including 9 who worked around the clock to upgrade the MyAU portal environment. 4 NOC (Network Operations Center) team members stayed overnight in the data center throughout the storm to provide 24/7 monitoring of the IT infrastructure. Under normal conditions, only 1 NOC team member is scheduled per shift. 438 Help Desk support requests resolved. 4,000 concurrent users a day of AU’s wireless network on Saturday and Sunday; 5,000 concurrent users a day of AU’s wireless network on Monday and Tuesday. 575 AU employees from across the university worked remotely via the VPN (Virtual Private Network). 25 percent more VPN users could work remotely at the same time. This thanks to OIT procuring 50 additional VPN licenses from the vendor in advance of the storm. 28 police officers and 8 dispatchers worked 12 hour shifts—4 hours longer than their typical 8 hour shifts. 9 police officers and 3 dispatchers stayed on campus overnight to ensure shift coverage. 5 staff members worked to communicate information from administrators about weather operating status. 4 + channels for communicating weather operating status, including the university website, social media, AU Alerts via Get Rave, and news media outlets in the Washington, DC and Baltimore, MD areas.